Move over Oculus Quest, HTC has announced the price, release date and specs for its standalone Vive Focus Plus headset and, like Obi-Wan in The Revenge of the Sith, it’s taking the high ground. To that end, expect to see the more business-centric VR headset on sale starting on April 15 for $799/ £639 (around AU$1,100) with the ability to tack on its Advantage program - HTC's Apple Care equivalent - for an extra £115 (around $150/AU$200). Not only is HTC's headset a little pricier than the $399 Oculus Quest, but it's also a bit higher spec'd as well and features a 3K AMOLED (2880x1600) screen and Qualcomm Snapdragon 835 processor. That said, the display only has a native refresh rate of 75Hz and 32GB of storage - really only enough to store business applications and some local files. 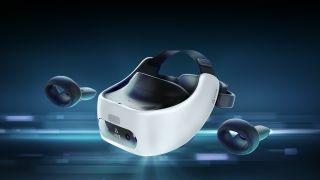 While the Focus Plus isn't going to be your go-to headset for play games like Beat Saber, HTC says the headset will offer 250 Vive Wave applications at launch that run natively on the Vive Focus Plus, and can access the Viveport Infinity Wave subscription program that includes over 70 premium titles, many of which have an educational or commercial purpose. But hey, the future of virtual reality can't be all fun and games, right?